Note: One recipe makes enough to stuff a chicken. A doubled recipe works well for a 15-20 pound turkey. 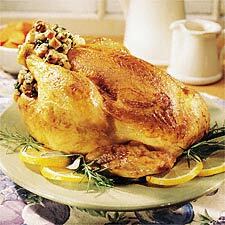 If you have any leftovers after stuffing the bird, you can cook them in a casserole dish for about 30 minutes or so and then toss together with the from-the-bird stuffing before serving. Also, if you want to reduce fat and calories, you can replace some or all of the melted butter with low fat chicken broth.